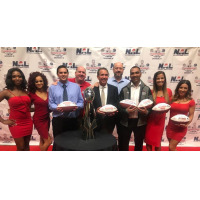 GREENSBORO, NC - The Jacksonville Sharks had yet another great season in the NAL in 2018. We had four First Team All-NAL players and three Second Team All-NAL Players, totaling seven players on an All-NAL Team. The NAL released their league awards last night and the Sharks looked to take home some important awards. Defensive Player of the Year: Defensive Lineman Jermiah Price - Jermiah Price is a veteran as a defensive lineman. He entered his eighth season in arena football and second with the Sharks. In 2018, Price had incredible games that lead up to this exciting award. That game, he had 6.5 tackles and four sacks alone. In the entire season, Price totaled 29 tackles (18 solo) (22 assists) (18.5 for a loss), 16.5 sacks, one interception, three pass breakups, one forced fumble, one fumble recovery, and an outstanding five blocked kicks! Price made First Team All-NAL and has appeared as the NAL Defensive Player of the Week in Week Eight. Most Improved Player: Defensive Lineman Damien Jacobs - Damien Jacobs entered his second season with the Jacksonville Sharks and had a much improved season. This year, Jacobs recorded 15.5 total tackles (nine solo) (13 assists) (four for a loss), five sacks, two pass breakups, two interceptions and one touchdown, one forced fumble, four fumble recoveries, one blocked kick, and one forced safety. All of these stats from Jacobs gave the Sharks eight points in the 2018 season. Assistant Coach of the Year: Dave Ewart - Dave Ewart entered the 2018 season with the Sharks as a veteran coach. He previously coached for two different colleges and eight different arena football teams in a span of 27 years. This year as an assistant, Ewart helped lead the Sharks to an impressive 10-6 record after a slow 1-3 start to the season. Throughout the year, the Sharks were on many win streaks, which helped them become the number one team in Week 17 of the regular season. Under Ewart's defense the Sharks earned Defensive of Player of the Year awarded to defensive lineman Jermiah Price and the league's Most Improved Player which went to defensive lineman Damien Jacobs. In addition, the Sharks defense boasted three First Team All-NAL Players and two Second Team All-NAL players. Best Media Relations: The Sharks took home "Best Media" again for the second year in row. Led by Multimedia Director Steven Shotola the Shark Media Department has continued to grow to bring the Sharks fans the best and most up to date news stories, live interviews, and superior creative content year-round. "It's an honor to be recognized again as the league's best." said Multimedia Director Steven Shotola, "We have the best staff and interns in the league that covered the team for every home & away game and they work with me tirelessly to give our fan base the best content that we can create so that no one misses a beat of Sharks football." Best Fans: The Jacksonville Sharks fans have done it yet again! We are the number one fans in the league, which means that there is nobody better than Shark Nation. We averaged 7,192 fans per game this season, which is the highest average in the entire league. Best Game Operations: Led by Director of Operations Kayla Sharp, the Sharks won two-straight "Best Game Operations Awards" and have by far the best game operations in the league and boasts putting on the best show in arena football during every Sharks home game. Whether it's setting up the field and making sure it's perfect for the game, scripting a unique and fun list of entertainment that Sharks have consistently created the best experience for the fans. The key for the Sharks has always been it's incredible use of fan involvement which includes activities on the field during a timeout or a commercial break. Under Kayla's leadership the Sharks game flow and entertainment value has been top tier since she took on the role in 2017. BEST DANCE TEAM: Jacksonville Sharks - The Jacksonville Sharks Attack Dance Team win their second consecutive "Best Dance Team" award in the NAL. There to accept the award was several members of the 2018 Attack Dance Team. This season, the dance team continue to prove to be the league's best, adapting to more off a hip hop influenced style the dance team stole the show at Sharks games thrilling thousands of fans at halftime and throughout the games. Led by Director Laura Bouchy, her husband and Managing Partner Jeff Bouchy spoke on her behalf explaining how much the dance team played a role in the Sharks organization and impact they have not only on the field but also off the field in the community. Bouchy told the story of "Lily" a young girl and aspiring young dancer from Scotland who was being treated in Jacksonville for cancer, the Attack Dance team took her under their wing and made her the youngest dance team member in team history the Attack's impact on that girl's life made a tremendous impression on both the local community but made international news. Within her time with the team, Lily herself made an impact on the lives of all the dancers, staff and fans. Proud to announce Lily is well into recovery and has returned to Scotland to continue to live a long and fulfilling life.